The International Council for the Exploration of the Sea (ICES), a network of over 4,000 scientists, warn that sharks in deep waters in the Northeast Atlantic continue to face a bleak future. ICES provided recommendations for three deep-sea shark species-kite fin sharks, leafscale gulper sharks, and Portuguese dogfish sharks-and advise that these sharks should not be involved in fishery activities. We here at Oceana in Europe believe this advice should signal the need for strong precautionary measures to protect these and other deep-sea shark species from overexploitation. "Heavy fishing drove these vulnerable species to depletion during a period of less than two decades, and there appears to be no evidence of any recovery, even seven years after target fisheries were closed," Oceana in Europe marine wildlife scientist Dr. Allison Perry said in a press release. "The EU needs to take a very hard and close look at whether it's doing enough to safeguard deep-sea sharks." 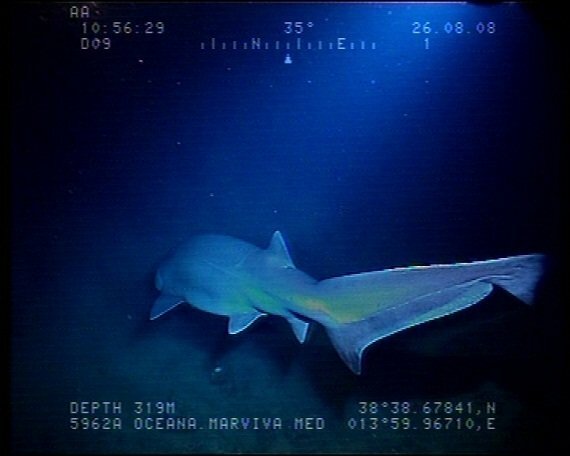 Deep-sea sharks are particularly vulnerable to over-exploitation because they're slow-growing, long-lived, and have slow reproduction rates. For example, the leafscale gulper shark reaches maturity at 35, and can live for up to 70 years. Despite these risks, some species of deep-sea sharks are heavily fished, especially for their oil-rich livers that are used in cosmetics, health supplements, and vaccines. Since 2007, targeted fishing of some deep-sea shark species has been prohibited in EU waters because of concerns about population depletion. And since 2012, a list of 20 deep-sea sharks have been prohibited from being included in fishery activities, including bycatch. This list, however, excludes other deep-water shark species that occur in the Northeast Atlantic and are known to be captured in fisheries.